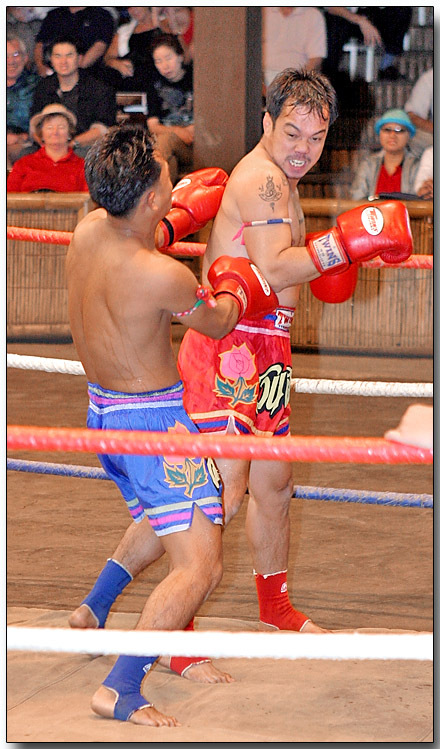 Thai boxing started in the medieval ages when wars were fought with bows and arrows, swords and pikes. And in close fighting the use of arms and legs, knees and elbows were formidable weapons. The sport was included in military training and was given prominence by King Naresuan 1560 A.D.
During one of many battles between Myanmar (Burma) and his country he was captured by the Myanmar, and knowing of his prowess as the best unarmed fighter in the realm, he was given the chance of fighting Myanmar's best to gain his freedom. He quickly beat all his opponents and won his liberty. Upon his return to Siam he was hailed as a hero and Siamese style boxing as it was called then was thereafter hailed as a national sport. Until a few years ago horse hide strips and later hemp was used to protect the hands, this has now given way to gloves, shirts and shoes are not permitted. Thai kick boxing reached its zenith of popularity about two hundred years ago in the reign of Pra Chao Sua, today it is still a very popular sport.